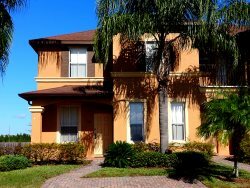 This comfortable family villa with 4 bedrooms and 3 bathrooms, sitting room and lounge, breakfast area has a large pool with spa, gets the Flordia sunshine for most of the day. Easy access to the theme parks and the new Lego Land. It is near to all attractions but far enough for a peaceful vacation.